Opens up quite a few of cans of worms for me about the liabilities and interstate state practice without a license. When I responded, a structural engineering "assistant" responded on the chat page. Only $5 for one week. Cancel anytime. Specialties include: Structural, Chemical, Civil, Industrial, Mechanical, Electrical, Other Engineering and more. Similar to this: thread507-318731: Free structural engineering! That's what I suspected. Thanks for the confirmation. Seems to me that anone listed on that site intimating that they are an engineer could have their license in jeopardy, if, in fact, they are licensed. Right now, I am really pissed off. If they tell me that the ground floor column of the skyscraper can in fact be removed, I do it, and it collapses...What happens next??? Theres tons of these for lawyers/solicitors as well - afaik all massive scams. Honestly, if someone is stupid enough to fall for this sites deceptions and has a tight budget such that $5 looks appealing, do you really want them as a client anyway? I do a lot of work for "weekend warriors". I tell them the fees up front - same price for 5 minutes or 1 hour. Their response determines if I take the job. Enter one of these sites and try to track down a real engineering answer to a real engineering question. You will share the fate of Beavis and Butthead. So XR250, when one of those 'weekend warriors' decides that your fees are too high, and instead goes on a website to get the answer for $5, gets the answer they want to hear, knocks down a load bearing wall, and gets buried by the house falling in on them, who looks bad? All of us, that's who! 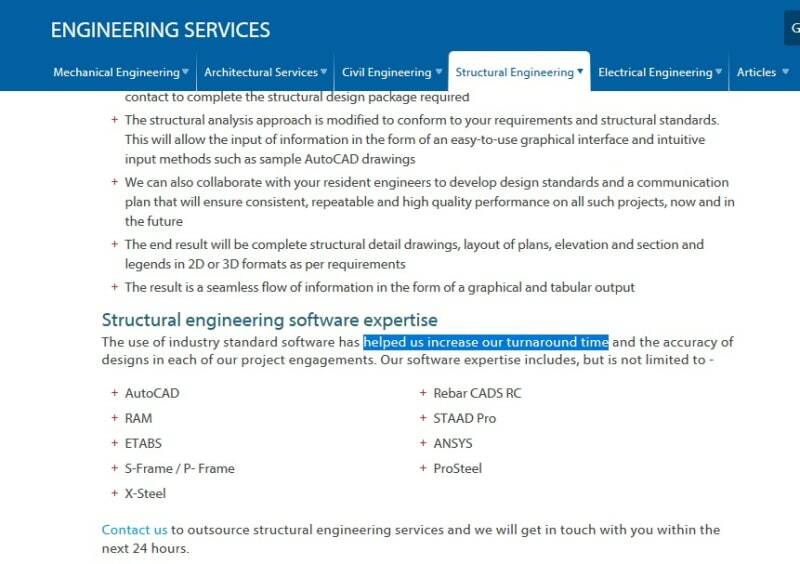 I realize the stupidity of the clients asking the questions on these sites, but am far, far more concerned about the "engineers" offering "advice based on a phone call from one not versed on the profession. Unless bogus, these people should know better and engage in ethical behaviour. Kinda the perfect storm here.. But, I guess it's all about the money. Can't sites like these be shut down? Yea, I know that another will.pop up, but so do pimples. Maintenance and policing are the issues. Who is going to do this if not the professionals like us? I sympathize with the rest of you that this is a disaster waiting to happen, and is wholly against any engineering ethics. With that said i think its an interesting point that Mike made about shutting down the sites. What ability do we as a self governed profession have to police this type of thing in the internet age? It's hard enough for government agencies to take down sites and keep them down (Pirate bay as an example) what kind of action can be taken by the governing bodies? I would guess the best course of action would be to go after the individual engineers but that also seems like a losing battle and a bit of a whack a mole type scenario given they don't appear to be required to use their actual names. I don't want this to sound nihilistic or defeatist but I'm actually curious what some actionable steps we can take are. If you look over the past thread on this site that I linked to above, I believe I recall calling our local engineering board to discuss this site and issue. The response on their end was sort of "deer in the headlights" as I don't think they'd ever had this issue come up before. I think the problem is that most boards only respond to explicit complaints - i.e. someone uses the site and gets cheated, or the proposed solution was wrong, fell down, etc. So I didn't get much response other than they didn't think they could reach out halfway across the country and attempt to discipline someone online in who-knows-what location. Typically, I'd think that anyone who used this site and had a problem would not know to call on the board but rather simply get a lawyer and try to sue. Ok, and thanks for the responses. I feel that here is a professional responsibility here for all PE's with the knowledge of these sites to complain to their state boards. If the boards can't or won't do anything, then at least we have done our due diligence. I would still remain a thorn in their side by periodically complaining, sending letters FedEx or similar so they have to be signed for. Personally though, I think we can do more. Additionally, writing our concerns to local congressmen and cc'ing the state boards anc ICC is an additional option here. New legislation may be needed at the federal level. Perhaps I am being too altruistic, but I feel we all need to do more to protect not only our livelihood, but, more importantly, the reputation of our profession. I have no idea is this is ethical or legal; but one could conceivably entrap them by asking for a design, building it, and then letting it safely fail (if it even gets built). Then one could take that to a lawyer and/or state board. Ideally you would do this in the same state the company is registered in; making it easier to file a lawsuit. I'm not that brave but I bet there's some lawyer out there who is. FCC: Federal agencies don't regulate state laws. Federal regulations do set the guidelines for state laws though. Any product, physical or electronic, transgressing state boundaries is subject to federal regulations. Thst's why we have the Interstate Commerce Commission (ICC). Also, the FCC does monitor and regulate HAMM operators in all states as well as nautical RTO licenses and transmissions. Have experience with both in the past... and have dealt with the FCC directly. Mike - yes, I think there is the issue of inter-state commerce....but the Federal agencies monitor inter-state commerce with respect to federal laws. The engineering practice laws are all held by the states so I'm not sure 100% that the Feds would even be interested. There are no such things as Federal engineering practice laws that coincide with, or over-rule the state laws. I could be wrong. There are a lot of things on the internet to be annoyed about. This is just another. I don't like your chances of doing anything about it. 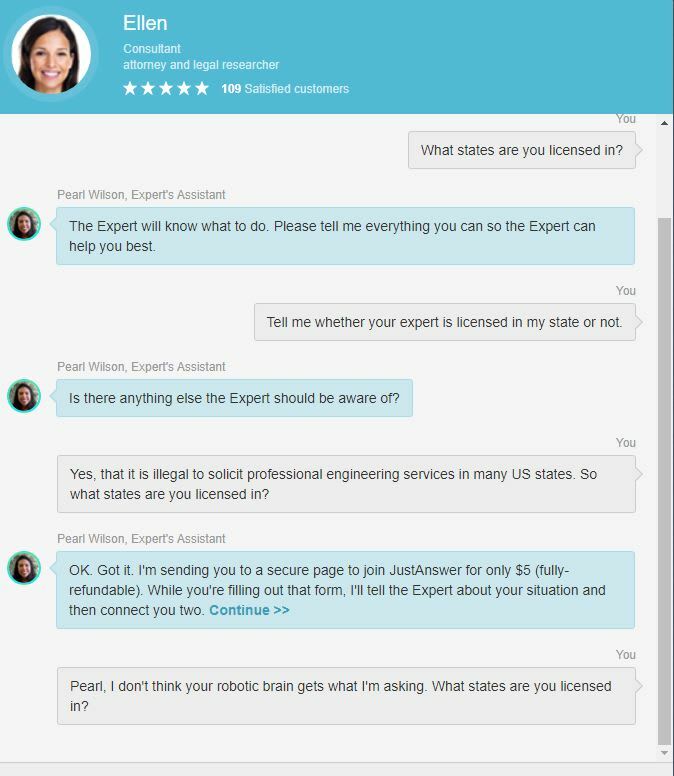 I think it’s likely the engineer “expert” is not even located in the US. Could we all send emails to our respective State Lic boards? There should be enough people to hit all 50 states. If you advertise engineering services, you need a Business State Engineering License and a PE with the State Lic. on staff. Pretty soon, the "E" in Ebay will stand for "Engineering". Ha! 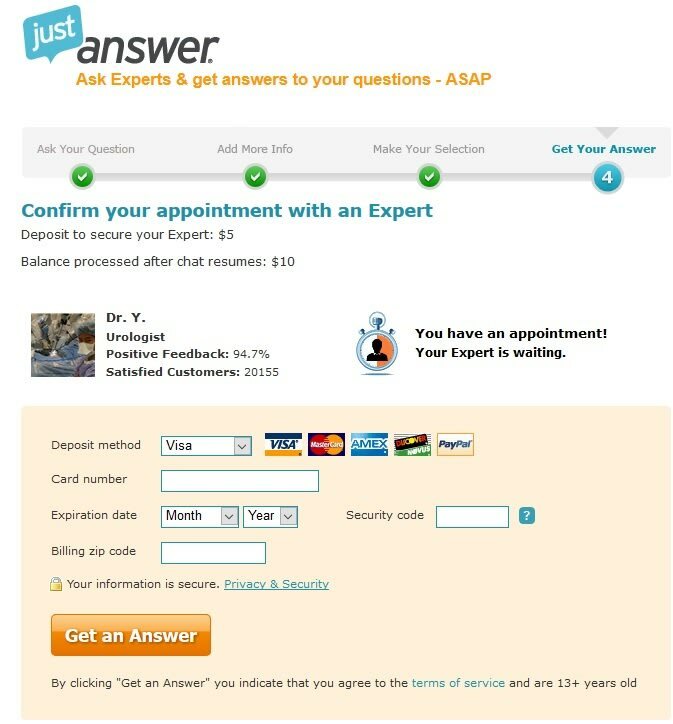 My "expert" that was going to answer my structural engineering question is a urologist! Another funny bit - I guess you get what you pay for. Using all that software has "helped us increase our turnaround time."